Thanks for visiting Summit Taxidermy on the web! At Summit, our focus is unique and realistic wildlife re-creations. We're dedicated to advancing the art of taxidermy. 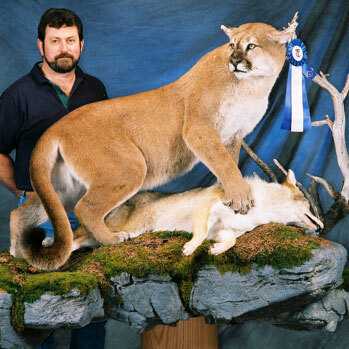 For a Taxidermist, the subject or specimen must be presented in a realistic manner. The art in any taxidermy work revolves around the position and presentation of that subject and any story that may be portrayed in the entire piece. The base work may incorporate some stylistic or impressionistic features but care should be taken to do this tastefully and in moderation, or risk drawing attention away from the taxidermy. We've made it our mission to further the appreciation of taxidermy as an art form, for the clients and practitioners, as well as the public. We have created a limited number of premium taxidermy forms, which will appeal to discriminating taxidermists and their clients. You can also link to downloadable reference photos of projects created with these forms. We are proud of our reputation for excellent quality combined with creative flair. We welcome the opportunity to provide our products, service or advice. We've recently added a "Tips and Technical Support" section to further our stated mission. Over time, we hope to build it into an invaluable resource for our fellow taxidermists to use. We hope you enjoy your visit and find all the information you need about our products and services. Please feel free to call us. We'd love to talk to you!